Panforte (pronounced pan-FOHR-tay) is a Christmas fruit cake originating from Siena Italy. It also goes by the name Siena Cake. Although it does have some similarities to the 'British' fruit cake (containing the traditional fruit, nuts, and spices) its' texture and flavor are very different. 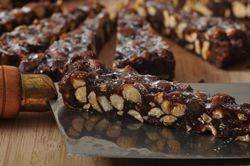 Bite into a slice of Panforte and you may be surprised to find how chewy it is. This chewy texture comes from mixing the fruit, nuts, spices, and flour (just enough to bind the ingredients), with a boiled syrup made from sugar and honey. This sugar/honey syrup, along with the addition of melted chocolate and cocoa powder, gives this Christmas cake an almost candy-like texture and flavor which is hard to resist, even for those who normally dislike fruit cake. Traditionally Panforte was baked in a round pan that had been lined with communion wafers (to make it easier to remove) which seems to indicate a religious connection. History does tell us that Panforte dates from the 12th century and, although stories differ, most agree that Nuns (hence the use of communion wafers) were the first to make this delicious bread. Now, for most of us communion wafers can be difficult to find so luckily Jane Grigson in 'The Best of Jane Grigson - The Enjoyment of Food' offers us a great substitute; edible rice paper, which is available at most Asian markets. Although for this recipe we are simply going to line the bottom of the pan with parchment paper. Another distinctive characteristic of this cake is the dusting of the top of the cake with confectioners' (powdered/icing) sugar. This gives it a very festive 'snowy' look which adds to the holiday mood. Although this cake was once made only during the Christmas season, its popularity has now made it a year round favorite. As far as making this recipe, its fairly easy, the only difficult part is the making of the sugar syrup which a good candy thermometer will take care of. Once the honey and sugar are boiled to the soft ball stage (240 degrees F) (115 degrees C) it is poured over the rest of the ingredients. At this point you will need to work quickly before the mixture stiffens and becomes difficult to spread in the pan. Traditionally this cake was made with almonds but hazelnuts as well as macadamia nuts are excellent in this cake. And although I have used candied lemon and orange peel you can vary this recipe by using other candied fruits or even dried fruits (cranberries, cherries, apricots to name a few) especially if you want to make this cake off season when candied fruits are difficult to find. Another thing about Panforte is that some like it very spicy so if you prefer it that way, go ahead and add some white or black pepper (1/2 to 1 teaspoon). Incidentally, cocoa and chocolate were not found in the Panforte made by the Nuns. It wasn't until the 1800s that these ingredients made their way into the recipe and today you can find Panforte both with and without chocolate. A final note, Panforte is like other fruit cakes in that it stores well. So you can squirrel it away in the cupboard and cut off a sliver any time of the year that your sweet tooth beckons. Panforte: You will need a 9 inch (23 cm) springform pan (or a two piece tart pan). Butter and line the bottom of the pan with parchment paper. Preheat your oven to 350 degree F (180 degree C). Place the hazelnuts on a baking sheet and bake for approximately 10-15 minutes or until brown and fragrant and the skins start to peel. Remove from oven, place on a wire rack, and cover the hazelnuts with a clean dish towel. Let the nuts 'steam' for about 5 minutes. Then briskly rub the nuts to remove most of their skins. Set aside to let the nuts cool completely and then coarsely chop. Next, place the almonds on a baking sheet and bake for about 6-8 minutes or until lightly brown and fragrant. Let cool and then coarsely chop. Reduce your oven temperature to 300 degree F (150 degree C). In a large bowl combine the nuts, candied fruit, spices, flour, salt, and cocoa powder. Melt the chocolate in a stainless steel bowl placed over a saucepan of simmering water. Then stir the melted chocolate into the chopped nut and fruit mixture. In a saucepan, stir together the sugar and honey. Place the saucepan over medium heat and bring to a boil, stirring until sugar has dissolved. Wash down the sides of the saucepan with a pastry brush that has been dipped in warm water. Then clamp a candy thermometer to the side of the saucepan. Continue to boil the mixture over medium heat, without stirring (swirl the pan if necessary), until the temperature reaches the soft ball stage, 240 degrees F (115 degrees C). Remove from heat and stir the sugar/honey syrup into the chopped nut and fruit mixture. The mixture will stiffen quickly so once combined, transfer to your prepared pan. With damp hands, or the back of a spoon or offset spatula, evenly spread the Panforte, smoothing the top. Bake in your preheated oven for about 30 - 35 minutes or until the surface has fine blisters. Remove from oven and place on a wire rack. While the Panforte is still warm, remove the sides of the pan and heavily dust the top of the cake with confectioners' (powdered/icing) sugar. Gently rub the sugar into the cake. Once the cake has completely cooled, wrap tightly in plastic wrap and store in a cool, dry place. Well wrapped this cake will keep several months. Serve this cake in thin slices as it is quite rich.